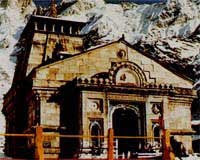 Kedarnath Temple is part of the Char Dham Yatra in Uttarakhand, India. In 2018, the opening date of Kedarnath Temple is April 29, 2018. The temple will close after Diwali on November 7, 2018. Chardham Yatra comprises of pilgrimage to Badrinath, Kedarnath, Gangotri and Yamunotri in Himalayas in Uttarakhand in India. The four holy shrines remain closed during winter season from October to April due to heavy snowfall. On April 26, 2018, the doli carrying the murti of Bhagavan Kedarnath will proceed from Omkareshwar Mandir in Ukimath, the winter abode of Lord Shiva. During the harsh winter period, the murti is kept at the Omkareshwar Temple at Ukimath and prayers are offered here. Kedarnath shrine is located at an altitude of 3584 m and is dedicated to Lord Shiva. It is one among the twelve Jyotirlinga temples. Legend has it that the Pandavas after the 18-day Great Kurukshetra War in the Mahabharata felt guilty of having killed their relatives and sought the blessings of Lord Shiva for salvation here. Adi Shankaracharya is supposed to have worshipped at Kedarnath Temple and fixed the method of puja. Kedarnath Temple was hit badly by the flash flood in June 2013 - the number of devotees that will be allowed on daily basis in 2018 is not yet known.